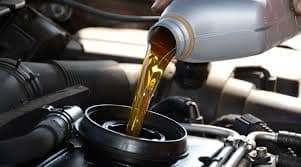 Full Service always available on Saturdays! 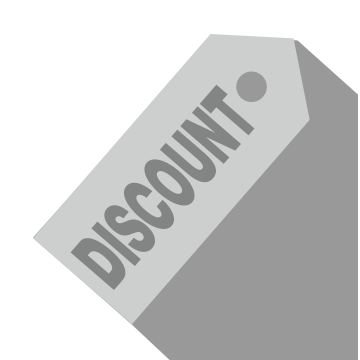 Not to be combined with any other discounts. Price may vary by model and size. Only valid at Schlossmann Honda City in Milwaukee, WI. Not redeemable on previous purchases. Contact dealer for details. Price does not include tax, shop supplies or hazardous waste fees. Additional savings for a limited time! For optimal performance, gas mileage, and safety choose Honda authorized tires from Honda City. *Installation extra. Not to be combined with any other discounts. Price may vary by model and size. Only valid at Schlossmann Honda City in Milwaukee, WI. Not redeemable on previous purchases. Contact dealer for details. 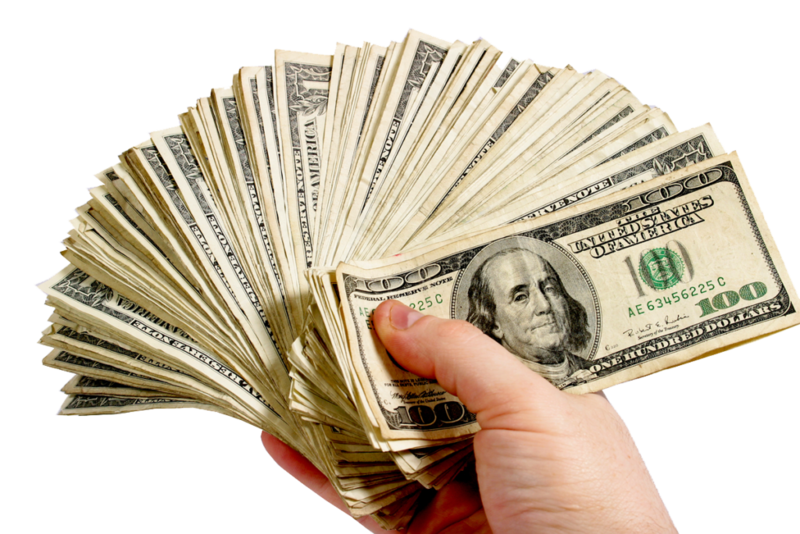 Price does not include tax, shop supplies or hazardous waste fees. On in-store purchase only. 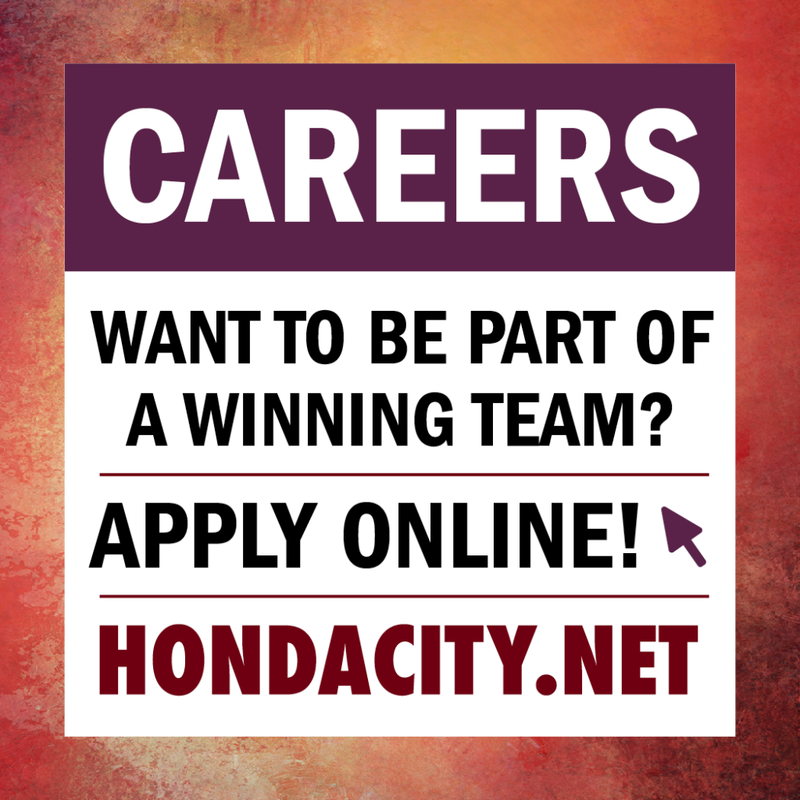 If you’re looking for a career opportunity in the automotive industry as a valued team member at the Schlossmann Automotive Group, your search is complete. Schlossmann Automotive has a great history of providing excellent automotive career opportunities in the Milwaukee area for sharp, energetic people. 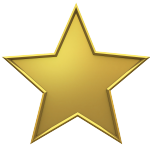 Honda City can work on any make and any model cars and trucks. 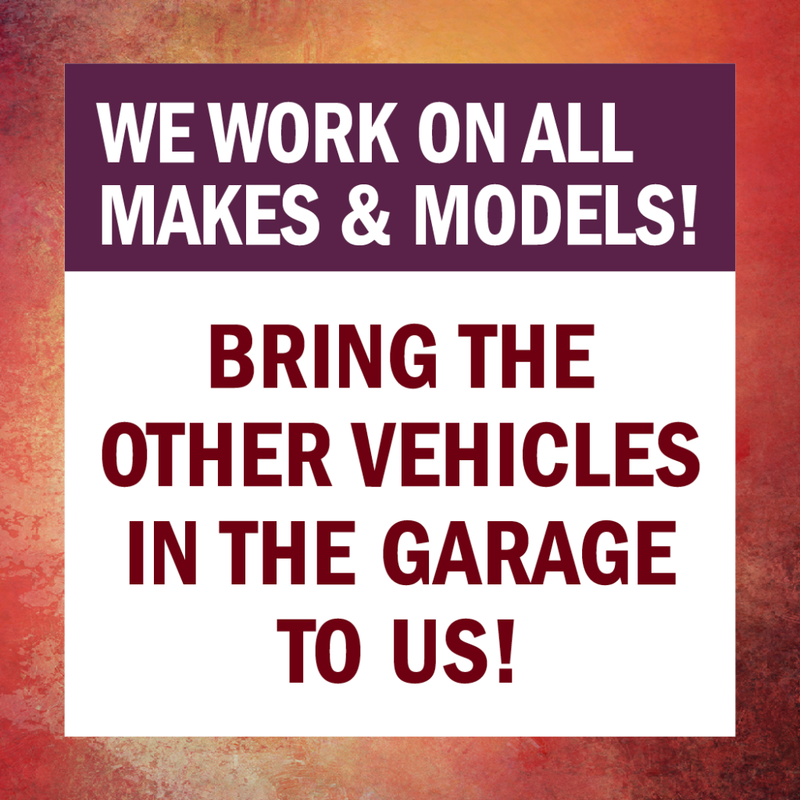 You can bring in that other car in your garage and receive the same level of expert service. Need Help Paying for Repairs? How about 60 days free financing? Application generally takes a few minutes. All applications are subject to approval. Maximum amount, terms and APR based on credit history. Not valid towards a previous purchase. 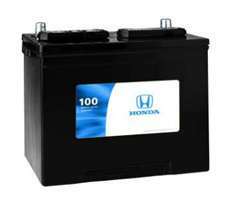 Please see Honda City Service Dept. for details. 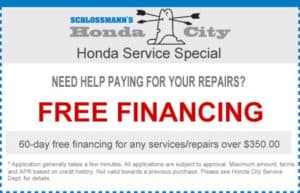 Only valid at Schlossmann Honda City in Milwaukee, WI. Breath easier knowing that Genuine Honda Brake Pads are engineered to meet the exact braking specifications of your Honda. Come in to get your brake pads replaced and the rotors resurfaced today! Prolongs the life of the tires and promotes vehicle safety! Proper wheel alignment is one thing that plays an important role. Wheel alignment affects fuel efficiency, tire wear, tire performance, vehicle handling and maneuverability. Wheel alignment is a big factor in a vehicle’s steering response. When tires and wheels are out of alignment, a number of problems can develop within a vehicle’s various systems. When alignment is really bad, it’s easy to tell as you drive. The vehicle will pull one way or the other. In other words, if you let go of the steering wheel and the vehicle immediately steers to the left or right, there’s a good chance that there’s an issue with your wheel alignment. Misalignment may also cause vibration that you’ll feel especially in the steering wheel. Simply put, proper wheel alignments allow for safer driving. 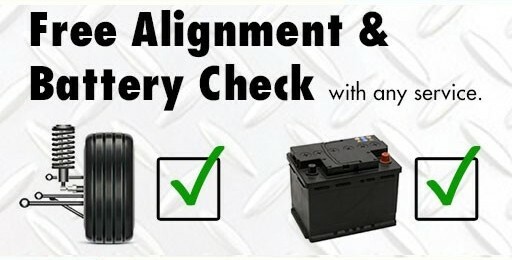 Wheel alignment will also extend the life of your tires. 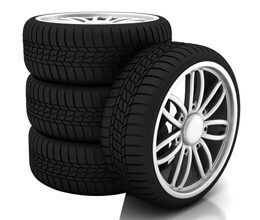 Incorrectly aligned wheels are one of the main causes for uneven and/or premature tire wear. Uneven tread wear will decrease the safe driving life of a tire, or in a worst case scenario may damage a tire beyond repair, requiring premature replacement. Proper wheel alignment is one thing that plays an important role. Wheel alignment affects fuel efficiency, tire wear, tire performance, vehicle handling and maneuverability. 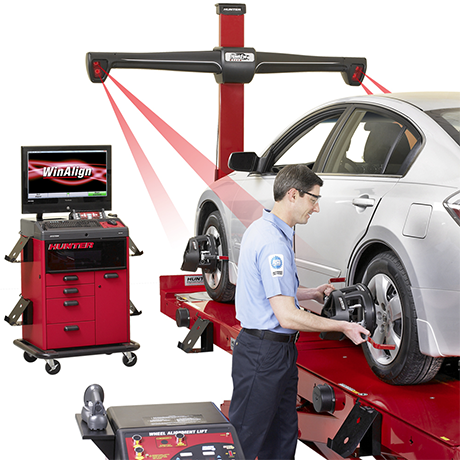 Wheel alignment is a big factor in a vehicle's steering response. 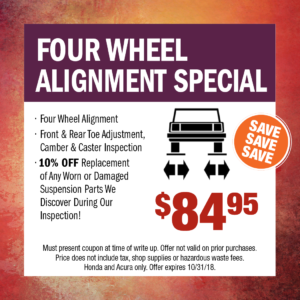 When tires and wheels are out of alignment, a number of problems can develop within a vehicle's various systems. When alignment is really bad, it's easy to tell as you drive. The vehicle will pull one way or the other. In other words, if you let go of the steering wheel and the vehicle immediately steers to the left or right, there's a good chance that there's an issue with your wheel alignment. Misalignment may also cause vibration that you'll feel especially in the steering wheel.